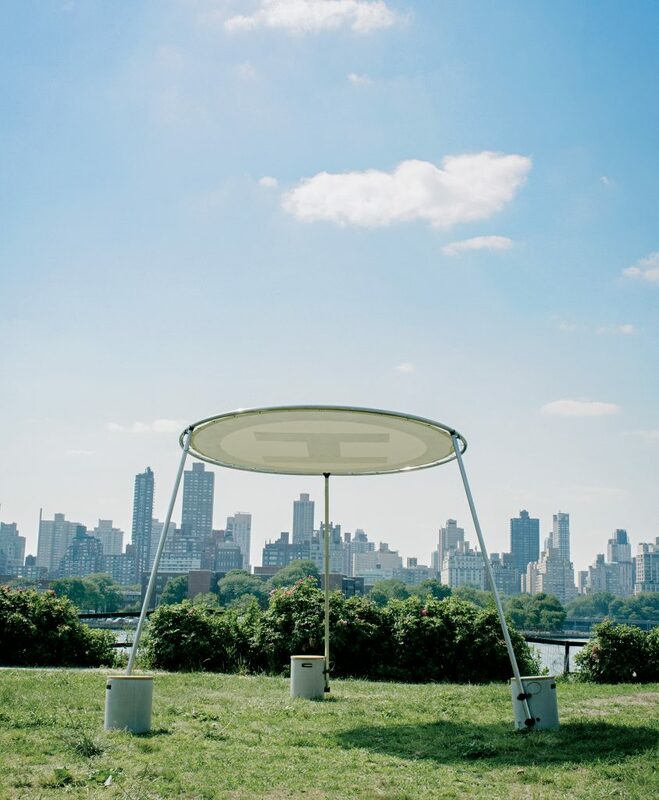 As part of the annual Open House New York Weekend, join the Architectural League of New York and Eva Jensen Design for a special presentation on Circle Shade – 2πR4, a new portable shade structure that has activated the Park throughout the 2017 season. Circle Shade—2πR4 is the winning entry to the 2017 Folly / Function competition run by the Architectural League of New York and Socrates Sculpture Park. The challenge was to create four portable, deployable canopy structures for flexible use throughout the highly active environment of Socrates Sculpture Park. Circle Shade—2πR4 consists of three main components—a circular canopy, aluminum support poles, and cylindrical drum counter weights. The circular canopy is connected to the poles with custom designed high strength structural 3D-printed joint nodes, engineered as rigid connections, with the ability to customize for variable pitches to the canopy. Elegantly simple, each canopy tilts while the structures can rotate in position to one another, exuding a playful character that complements the spirit of the Park. A free OpenDialogue talk and tour with Circle Shade—2πR4 architect Eva Jensen will take place at 3pm. Meet at the Park’s main entrance at 32-01 Vernon Boulevard at Broadway.